Rawlins County is in the first row of counties south of Nebraska and in the second row of counties east of Colorado. Rawlins County is bounded on the west by Cheyenne County, on the south by Sherman and Thomas counties, on the east by Decatur County, and on the north by Dundy, Hitchcock, and Red Willow counties of Nebraska. The county contains 30 townships and has an area of about 1080 square miles. Rawlins County lies entirely within the area designated by Fenneman (1931) as the High Plains section of the Great Plains physiographic province. The upland areas of the county consist of nearly flat to gently rolling terrain having many undrained depressions and a few shallow valleys. The upland surface of the county slopes generally eastward at a rate of about 10 to 14 feet to the mile. Areas bordering the major streams of the county are deeply dissected (Pl. 2) and have a very rugged topography that contrasts sharply with the nearly flat uplands. The areas of deep dissection extend about 2 or 3 miles on each side of the major streams, and in general the slopes are much steeper on the south side of streams than on the north side. The altitude of the flat valley areas of the county averages about 200 feet less than the flat upland areas. Plate 2--A, Mortar beds of the Ogallala formation exposed by erosion along a tributary to Beaver Creek, near the NE cor. sec. 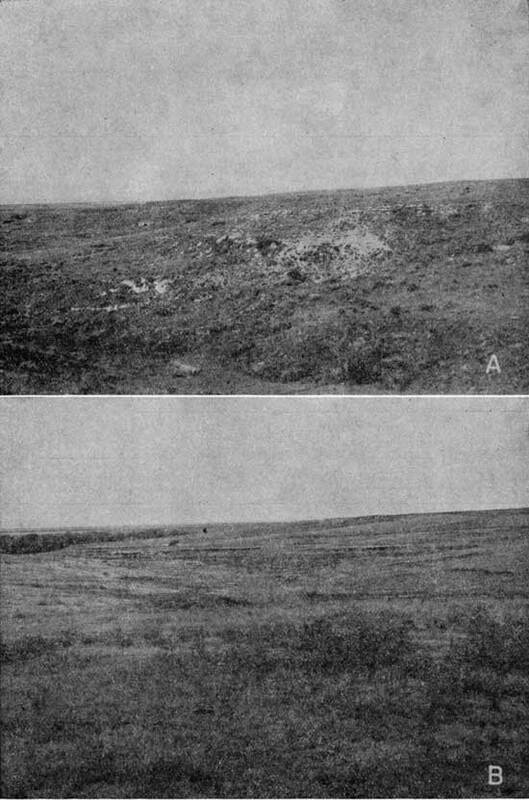 23, T. 5 S., R. 26 W. B, View to the east illustrating the steep slope from the upland to the valley of North Fork Sappa Creek, sec. 23, T. 4 S., R 32 W.
Beaver Creek, which has its source in Colorado, is the largest stream in Rawlins County and with its tributaries drains about half the area of the county. Little Beaver Creek, which also has its source in Colorado, enters Rawlins County 9 miles north of the Sherman County line and joins Beaver Creek at Atwood. North Beaver Creek has its source north of McDonald and joins Little Beaver Creek near Blakeman. North Fork Sappa Creek, which originates about 6 miles east of the southwest corner of Rawlins County, is joined in eastern Rawlins County by Middle Fork Sappa Creek. South Fork Sappa Creek, which drains the southeast township of Rawlins County, joins North Fork Sappa Creek about 3 miles west of Oberlin in Decatur County. East Fork Burntwood Creek, which is the only creek in the county that does not flow in general northeasterly, is an ephemeral stream that flows north through the northwest township of Rawlins County. The climate of Rawlins County is subhumid to semiarid and is characterized by slight to moderate precipitation, moderately high average wind velocity, and rapid rate of evaporation. During the summer the days are hot, but there is generally good wind movement and low relative humidity. Summer nights are generally cool. Winters are generally mild, except for short periods of severe cold. The climate of Rawlins County is well suited to the raising of winter wheat. Moderate acreage of alfalfa is grown in the valleys where the water table is near the surface or where irrigation is practiced. Areas of the county that are unsuitable for cultivation are used for cattle grazing. According to data presented by the United States Weather Bureau, the normal annual mean temperature at Atwood is 52.3° F. The normal monthly mean temperatures for June, July, and August, generally the hottest months, are 71.3° F., 78.0° F., and 75.4° F. respectively. The normal monthly mean temperatures for January and December, generally the coldest months, are 28.0° F., and 29.7° F., respectively. The growing season, the average interval between the last killing frost in the spring and the first killing frost in the fall, averages about 155 days and has ranged from 114 to 182 days. The average date for the last killing frost in the spring is May 3, the latest date for a killing frost in the spring is May 26. The average date for the first killing frost in the fall is October 5. The earliest date recorded for a killing frost in the fall is September 12. The normal annual precipitation at Atwood is 18.53 inches. The recorded annual precipitation ranges from a minimum of 11.32 inches in 1934 to 29.68 in 1923. More than half the precipitation falls during the growing season from May through September when moisture is most needed. The normal monthly precipitation for the period 1898 through 1942 is given in Table 1. Table 1---Normal monthly precipitation at Atwood, Kansas. The annual precipitation and the cumulative departure from normal precipitation at Atwood are shown graphically in Figure 3. Figure 3--Annual precipitation and cumulative departure from normal precipitation at Atwood, Kansas. According to the 1950 Federal census the population of Rawlins County was 5,728. [Note: Rawlins County population was listed as 2,966 in 2000 U.S. census, with a density of 2.8 (32.9 for the state) (KU Institute for Policy & Social Research).] The average density of population was 5.3 per square mile as compared to 23.2 for the state. The population of Rawlins County was 6,618 in 1940 and 7,362 in 1930. The population of Atwood, the county seat of Rawlins County, in 1950 was 1,613 [1,279 in 2000]; McDonald had a population of 426 [159 in 2000], and Herndon 321 [149 in 2000]. Rawlins County is served by a branch line of the Chicago, Burlington, and Quincy Railroad, which leaves the main line at Orleans, Nebraska, and terminates at St. Francis in Cheyenne County. This line, traverses the county east-west along Beaver Creek and Little Beaver Creek to a point between Blakeman and Beardsley, where it leaves the valley and continues west through Beardsley and McDonald. U. S. Highway 36 passes east-west through Rawlins County through the city of Atwood. State Highway 25 passes through the approximate center of Rawlins County from north to south and intersects U. S. Highway 36 at Atwood. State Highway 117, which extends north-south between the Nebraska line and U. S. Highway 36, passes through Herndon. The rest of the county is served by many improved county and township roads. Placed on web Nov. 17, 2008; originally published Dec. 1956.